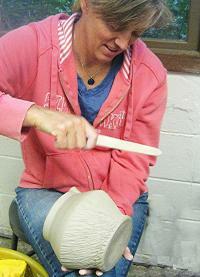 I studied ceramic art at Kent State University, The School of the Art Institute of Chicago, and Alfred University, NY. I'm currently living in Ames, Iowa where I've setup a large clay studio and showroom to both create and sell my work. I love to make unique and functional pieces that can brighten up your day. My work ranges from favorite coffee mugs, butter dishes, cookie jars, and extra large bowls to leave on your kitchen counter (fruit, veggies, mail...). Some of my work is created on the potters wheel and some is created using hand-building techniques. All of my pieces have textures juxtaposed with smooth surfaces. I then use both satin and glossy glazes to enhance these differences.